This article is from Tar Heel Junior Historian, published for the Tar Heel Junior Historian Association by the North Carolina Museum of History. Used by permission of the publisher. For personal use and not for further distribution. Please submit permission requests for other uses directly to the museum editorial staff. Reprinted with permission from Tar Heel Junior Historian, Spring 1993. One of the saddest facts about World War I is that millions died needlessly because military and civilian leaders were slow to adapt their old-fashioned strategies and tactics to the new weapons of 1914. New technology made war more horrible and more complex than ever before. The United States and other countries felt the effects of the war for years afterwards. The popular image of World War I is soldiers in muddy trenches and dugouts, living miserably until the next attack. This is basically correct. Technological developments in engineering, metallurgy, chemistry, and optics had produced weapons deadlier than anything known before. The power of defensive weapons made winning the war on the western front all but impossible for either side. When attacks were ordered, Allied soldiers went “over the top,” climbing out of their trenches and crossing no-man’s-land to reach enemy trenches. They had to cut through belts of barbed wire before they could use rifles, bayonets, pistols, and hand grenades to capture enemy positions. A victory usually meant they had seized only a few hundred yards of shell-torn earth at a terrible cost in lives. Wounded men often lay helpless in the open until they died. Those lucky enough to be rescued still faced horrible sanitary conditions before they could be taken to proper medical facilities. Between attacks,the snipers, artillery, and poison gas caused misery and death. Airplanes, products of the new technology, were primarily made of canvas, wood, and wire. At first they were used only to observe enemy troops. As their effectiveness became apparent, both sides shot planes down with artillery from the ground and with rifles, pistols, and machine guns from other planes. In 1916, the Germans armed planes with machine guns that could fire forward without shooting off the fighters’ propellers. The Allies soon armed their airplanes the same way, and war in the air became a deadly business. These light, highly maneuverable fighter planes attacked each other in wild air battles called dogfights. Pilots who were shot down often remained trapped in their falling, burning planes, for they had no parachutes. Airmen at the front did not often live long. Germany also used its fleet of huge dirigibles, or zeppelins, and large bomber planes to drop bombs on British and French cities. Britain retaliated by bombing German cities. Back on the ground, the tank proved to be the answer to stalemate in the trenches. This British invention used American-designed caterpillar tracks to move the armored vehicle equipped with machine guns and sometimes light cannon. Tanks worked effectively on firm, dry ground, in spite of their slow speed, mechanical problems, and vulnerability to artillery. Able to crush barbed wire and cross trenches, tanks moved forward through machine gun fire and often terrified German soldiers with their unstoppable approach. 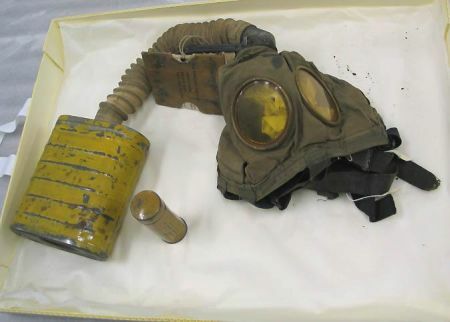 Chemical warfare first appeared when the Germans used poison gas during a surprise attack in Flanders, Belgium, in 1915. At first, gas was just released from large cylinders and carried by the wind into nearby enemy lines. Later, phosgene and other gases were loaded into artillery shells and shot into enemy trenches. The Germans used this weapon the most, realizing that enemy soldiers wearing gas masks did not fight as well. All sides used gas frequently by 1918. Its use was a frightening development that caused its victims a great deal of suffering, if not death. Both sides used a variety of big guns on the western front, ranging from huge naval guns mounted on railroad cars to short-range trench mortars. The result was a war in which soldiers near the front were seldom safe from artillery bombardment. The Germans used super–long-range artillery to shell Paris from almost eighty miles away. Artillery shell blasts created vast, cratered, moonlike landscapes where beautiful fields and woods had once stood. Perhaps the most significant technological advance during World War I was the improvement of the machine gun, a weapon originally developed by an American, Hiram Maxim. The Germans recognized its military potential and had large numbers ready to use in 1914. They also developed air-cooled machine guns for airplanes and improved those used on the ground, making them lighter and easier to move. The weapon’s full potential was demonstrated on the Somme battlefield in July 1916 when German machine guns killed or wounded almost 60,000 British soldiers in only one day. At sea, submarines attacked ships far from port. In order to locate and sink German U-boats, British scientists developed underwater listening devices and underwater explosives called depth charges. Warships became faster and more powerful than ever before and used newly invented radios to communicate effectively. The British naval blockade of Germany, which was made possible by developments in naval technology, brought a total war to civilians. The blockade caused a famine that finally brought about the collapse of Germany and its allies in late 1918. Starvation and malnutrition continued to take the lives of German adults and children for years after the war. The firing stopped on November 11, 1918, but modern war technology had changed the course of civilization. Millions had been killed, gassed, maimed, or starved. Famine and disease continued to rage through central Europe, taking countless lives. Because of rapid technological advances in every area, the nature of warfare had changed forever, affecting soldiers, airmen, sailors, and civilians alike. A. Torrey McLean, a former United States Army officer who served in Vietnam, studied World War I for more than thirty years, personally interviewing a number of World War I veterans. "World War I in Photos." The Atlantic. http://www.theatlantic.com/static/infocus/wwi/introduction/ (accessed April 16, 2015). "Wildcats never quit: North Carolina in WWI." State Archives of North Carolina. N.C. Department of Cultural Resources. http://www.history.ncdcr.gov/SHRAB/ar/exhibits/wwi/default.htm (accessed September 25, 2013). WWI: NC Digital Collections. NC Department of Cultural Resources. WWI: Old North State and the 'Kaiser Bill.' Online exhibit, State Archives of NC. "Gas Mask. WWI. Used in France." NC Museum of History. Accession no. H.1999.1.406. http://collections.ncdcr.gov. 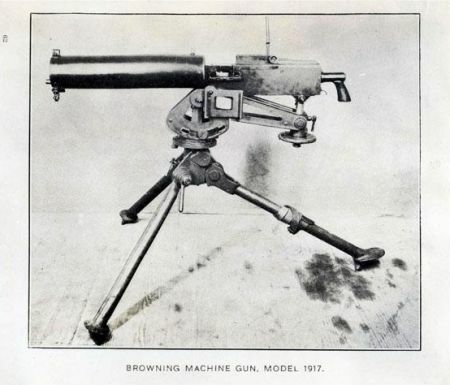 "Browning Machine Gun. Model 1917." 1918. NC Museum of History. Accession No. H.1918.31.9. http://collections.ncdcr.gov. Tar Heel Junior Historian, NC Museum of History. That's a really good question! As far as we can discover, while the Thompson machine gun was in development during World War I, it appears that it was not used in battle until World War II, with manufacturing beginning in 1921. Here is a page from the Smithsonian Institution on the U.S. Thompson M1 Submachine Gun that you might find helpful http://amhistory.si.edu/militaryhistory/collection/object.asp?ID=714. -What was the most important and resourceful piece of technology created during WWI, how did it work? -What types of challenges did people face to make them create this new technology? -Were the soldiers notified about the new technology as it came out or did they have to wait a long period of time? Wow, this sounds like a research project! I recommend contacting your local public library to help you find resources on these topics. Good luck in your research! Are these the only weapons used in war? If not what are the others? There are also several books and other resources on the topic. Your local library can help you find additional information and resources as well.